This post forms part of my evidence for earning the Web Literacy Ninja badge. For this badge I have show I meet all the competencies of the Web literacy map. This post covers the Exploring: navigating the web strand and I’ve broken the post down into each competency in the strand. I use a number of browsers to test websites so on any given day I will use Firefox, Chrome, Opera, Safari and even IE when have to. 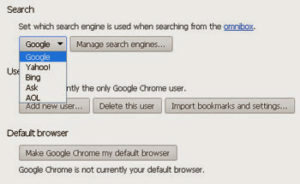 Browsers will allow you to choose a default search engine and change this within the settings. If unsure of why a link no longer works I can always try my hand on the fantastic Wayback Machine which takes snapshot archives of websites. Here is an archive of a website from my day job which goes back to 1999. As I moved this website to a new domain recently it’s very useful to look back at older versions. In my day job I set up shorter URLs for some pages for marketing purposes. Here is an example http://www.ncvo.org.uk/evolve2014. I often use the bit.ly add-on for Firefox to make my links shorter for social media use. You can change the language of the Webmaker website by changing this part (https://webmaker.org/en-US/explore) of the URL. Changing it to https://webmaker.org/it/explore changes the language to Italian. The URL of the Mozilla Webmaker website is https://webmaker.org/ and the IP address is 50.19.237.14. If I did a Google search for ‘Mozilla Webmaker’ it should be the top result. I record important links I find depending on where I find them. On Twitter I tend to favourite things for later reading. Links I want to keep for reference are also added to my Delicious and Pinterest accounts – there can be seen on the left widget panel of this blog. I keep an eye on other users and tags to build up links around similar subjects on all three of these social media sites. When searching I will use ‘ ‘ around my search term to help narrow things down. If your first search attempts ends up with a 404 error you can always try searching by just the domain or and try the site search once you arrive. Next to results on Google you have the handy cached link – particularly useful if the search link has now died. Direct links to files like PDFs sometimes fall in to this category. This website is also handy as is the similar link (which can be replicated by writing related:http://yoursite.com/ in the search bar). As well as search engines for finding out information quickly social media tools like Twitter can be very efficient. On twitter you can search for keywords. Tweeters can also use a ‘#’ in front of a common term to group the tweet with other similar tweets on the same subject. This can quickly build a conversation. The contact us page contains only a contact form with no details of address, email, phone number of other methods of contacting the owners or worse still there is no way of contacting anyone associated with the site. The website does not mention the names of any individuals involved. The owner(s) of the websites seem in every way to be ‘faceless’. There could be 1 or 2000 people involved in the site. Websites which claim to be run by organisation don’t display a UK company or UK charity number. The website contains content which does not seem to fit within its overall theme. The site might have a name which would indicate it was focused on a particular subject but then show pages which discuss something unrelated especially if this unrelated content was seemingly designed to gain revenue. The page layout, graphic design, navigation and written content do not fit the stated aims of the site. This often shows as a very cheaply produced site with poor content claiming to represent a very high end product or service. The who is record shows a company name that doesn’t seem to match up with the site and its stated objectives. This could be a company name that trades in domain names and has parked some guff site on that domain hoping some interested party comes along and asks to buy it. There are lots of sites which use scraping to copy content from other websites. There are lots of ways to prevent this including Google alerts of key terms which might get scraped. Personal information about me exists in the digital sphere but I try to be careful about giving too much away especially information about my location (past present or future), date of birth and family details. One of the reason I have this blog is to have some level over control about what is in the public domain. Is any of the stuff on this blog real? I couldn’t comment on that! I’m careful with passwords and I’m not going to discuss my methods for creating them here but you can rest assured they are long, complex and changed a lot. Dictionary words are not used. Here is some reasonable advice that I could get behind. I use browser plugins like DoNotTrackMe. This stops dodgy marketing companies from tracking my activity on the web and also masks my email address. Thanks to advice on the Webmaker website I also now use AdBlockPlus.